Charlestown Jan the 3 Dear Cousin I received your welcome letter and was verry glad to hear from you once more but verry sorry to hear that you have had so much sickness in your family. I hope your Mother's health will continue to improve. You wish to hear from Uncle Hezy and Aunt Sallie [?] health is verry poor indeed he is not confined to his bead but most of his time to his room some times he is able to go out in town and he attends Church often but he is allmost helpless. He can scarcely get out of his chair without healp and has not dressed hardly for more than a year with out help [In left Margin] - I should be delighted to pay you a visit perhaps we may in the spring. 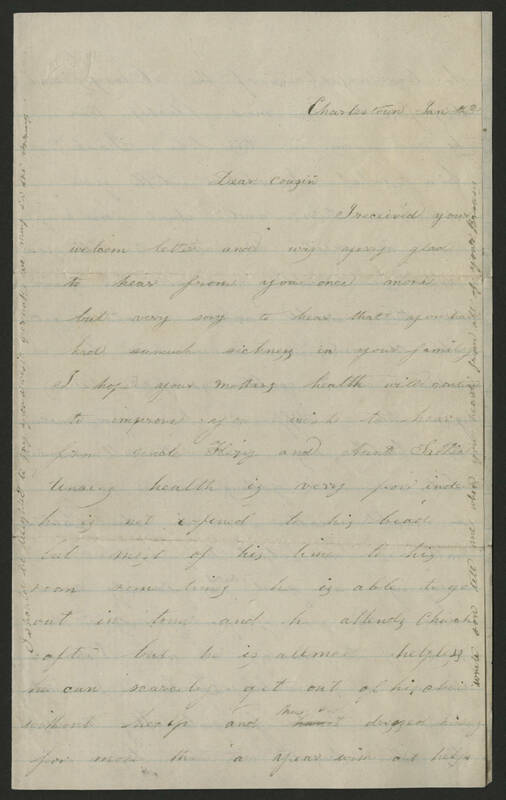 [in right margin] - wrote son tell me when you hear from all of your Brothers[? ].